A week on, and there is progress on my treatment decisions and I’m even upskilling myself on the side. Yesterday evening I went to a crochet class. It’s a skill I’ve always wanted and may be something I can amuse myself with as I go through the months of treatment. Our crochet teacher was very patient, encouraging (I was definitely bottom of the class) and gave us tea and biscuits. It was all a bit too Cath Kidston for my taste, but apparently a booming business. They even host hen parties, although the teacher did say she doesn’t let the hens near the sewing machines once the prosecco has been flowing. This took two and a half hours. A blanket would take me a year. Earlier in the day I had seen my lovely professor again, armed with all my questions in my Project Lumpy notebook from the past week’s online research, advice from medical friends and general confusion. I’ve used mindfulness for the past couple of years (I have an app on my phone, it’s that easy!) but I wanted to know more – and the Ruby Wax book explains it in an accessible and amusing way. Deborah Hutton was taken at far too young an age by lung cancer, and she wrote her book about the practicalities of cancer treatment. There’s an interesting section on NICE guidelines which I wasn’t aware of. On the NICE website anyone can get details of the NHS treatment they should expect for any illness. Empowering stuff. Deborah also references a website called Healthtalk where patients share their experiences for a variety of illnesses. Whilst waiting, I spotted a woman, about my age, and she looked haunted by fear. She waited well over an hour for her appointment. A while later, she came out of the consulting room, gazing in to the middle distance, in silent shock. I so wanted to reach out to her and tell her I know how it feels, I know it’s overwhelming, I know it’s crap, but she’s not alone. Such is the surreal place where cancer takes us. My appointment went well. My professor listened to my concerns and explained his thinking and all the research, probabilities and data behind the advice on treatment options. He even sent me off to Imaging (no pizza bleeper this time) for another ultrasound to check my lymph nodes again, I suspect more to reassure me than anything. So, what did we discuss? Now I feel like Jennifer Aniston in those patronising L’Oreal adverts “Here comes the science bit – concentrate!”…..
My professor talked me through the three options to address the possibility of cancer in other lymph nodes in my armpit (axilla). He explained that, in a case such as mine, the chances of there being more cancer is very low (hence my extra ultrasound to take another look at the lymph nodes to see if any were enlarged and merited biopsy. None of them were – that’s a fist bump from me). Surgery to clear the axilla. The benefit of this is I would then know with certainty if there were any further cancer cells (even though that doesn’t mean the cancer would come back!). My professor said he has been persuaded many times to do this surgery and in the majority of cases the removed lymph nodes are all clear of cancer and perfectly healthy. The risk of surgery is damage to my nerves and lymphoedema. And as I have just had surgery to my armpit I now have scar tissue in there, which increases the risk of nerve damage. Professor Vaidya is very concerned for my quality of life and so does not favour surgery. Radiotherapy to the axilla, in addition to the radiotherapy I will have to the breast. Radiotherapy is not without side effects and risks, and having it to my armpit carries a risk of about 5% of shoulder stiffness. There is also a lymphoedema risk, but much lower than surgery. On the plus side, I may never need to shave that armpit again! So, I ended up feeling very confident to make a decision to not have surgery. I’m back on Monday 27th February to see my professor and radiologist again, just to confirm. What wonderful care. As I mentioned before, Oncotype DX is a genetic test of the tumour to predict the likelihood of recurrence, but in my case the NHS do not fund it as I’ll be getting chemotherapy anyway (this is where those NICE guidelines are useful). I checked with my private medical insurers, and they will fund it. So, discussed this with my professor, and he will refer me through his private practice, at Princess Grace Hospital. He also said I can meet one of the oncologists there to discuss my case to get another medical viewpoint. Now I’m feeling much more informed, and confident with my treatment decisions. I’ve read some awful stories of patients having challenges with their medical team, but so far that’s not been my experience, quite the opposite. I’ve joked with some of my friends who have experienced cancer about playing the cancer card on occasion. There’s something about facing this vile disease which elicits a macabre response. I suppose being able to laugh at cancer makes it easier to cope with, takes away some of its power. For example, on the tube a week before my surgery, I gave up my seat to a pregnant woman. She was wearing a “Baby On Board” badge. I wondered how my fellow passengers would react if I had a “Cancer On Board” badge and smiled to myself. 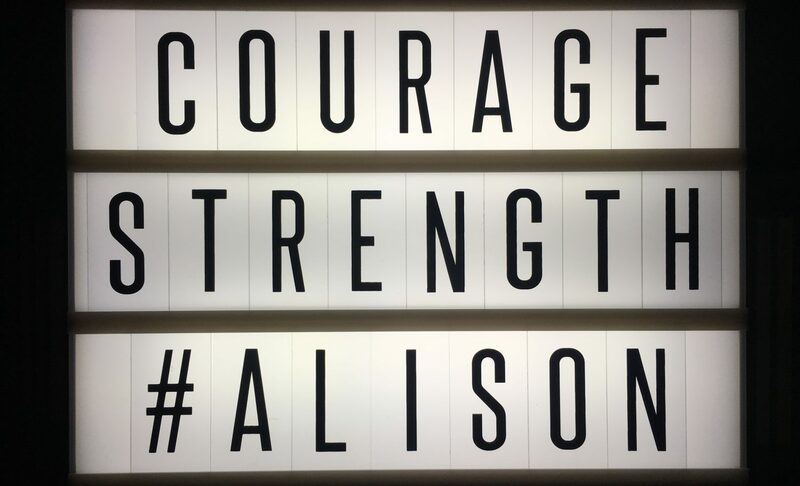 Hi Alison, I’m pleased that you’re now confident with your treatment choices and can move forward to the next stage of treatment. I had no idea how complicated this all is! Where are you living now? It would be great to have your address. Maybe you could email it to me.